However, in other cases, evaluating the sum-gradient may require expensive evaluations of the gradients from all summand functions. When the training set is enormous and no simple formulas exist, evaluating the sums of gradients becomes very expensive, because evaluating the gradient requires evaluating all the summand functions' gradients. To economize on the computational cost at every iteration, stochastic gradient descent samples a subset of summand functions at every step. This is very effective in the case of large-scale machine learning problems. Above information is describing test data? Is this same as batch_size in keras (Number of samples per gradient update)? The batch size defines the number of samples that will be propagated through the network. For instance, let's say you have 1050 training samples and you want to set up a batch_size equal to 100. The algorithm takes the first 100 samples (from 1st to 100th) from the training dataset and trains the network. Next, it takes the second 100 samples (from 101st to 200th) and trains the network again. We can keep doing this procedure until we have propagated all samples through of the network. Problem might happen with the last set of samples. In our example, we've used 1050 which is not divisible by 100 without remainder. The simplest solution is just to get the final 50 samples and train the network. It requires less memory. Since you train the network using fewer samples, the overall training procedure requires less memory. That's especially important if you are not able to fit the whole dataset in your machine's memory. Typically networks train faster with mini-batches. That's because we update the weights after each propagation. In our example we've propagated 11 batches (10 of them had 100 samples and 1 had 50 samples) and after each of them we've updated our network's parameters. If we used all samples during propagation we would make only 1 update for the network's parameter. The smaller the batch the less accurate the estimate of the gradient will be. In the figure below, you can see that the direction of the mini-batch gradient (green color) fluctuates much more in comparison to the direction of the full batch gradient (blue color). 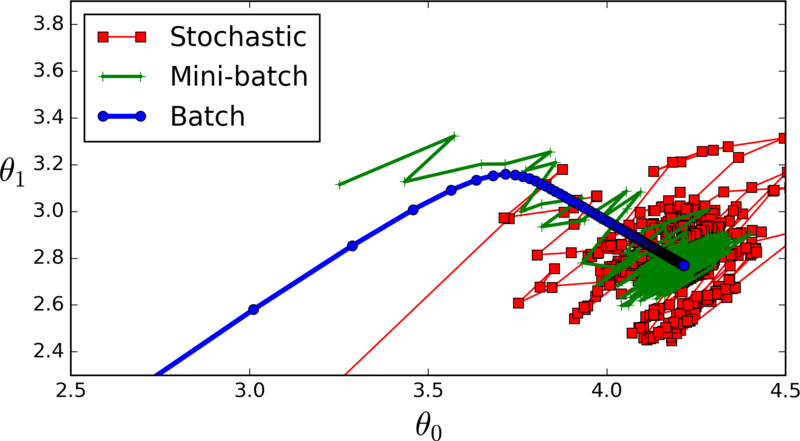 Stochastic is just a mini-batch with batch_size equal to 1. In that case, the gradient changes its direction even more often than a mini-batch gradient. When solving with a CPU an Optimization Problem, you Iteratively apply an Algorithm over some Input Data. In each of these iterations you usually update a Metric of your problem doing some Calculations on the Data. Now when the size of your data is large it might need a considerable amount of time to complete every iteration, and may consume a lot of resources. So sometimes you choose to apply these iterative calculations on a Portion of the Data to save time and computational resources. This portion is the batch_size and the process is called (in the Neural Network Lingo) batch data processing. When you apply your computations on all your data, then you do online data processing. I guess the terminology comes from the 60s, and even before. Does anyone remember the .bat DOS files? But of course the concept incarnated to mean a thread or portion of the data to be used. If you have a small dataset, it would be best to make the batch size equal to the size of the training data. First try with a small batch then increase to save time. As itdxer mentioned, there's a tradeoff between accuracy and speed. Not the answer you're looking for? Browse other questions tagged neural-networks python terminology keras or ask your own question. What is the difference between episode and epoch in deep Q learning? Why aren't vanishing gradients for deep networks a problem? What is the difference among stochastic, batch and mini-batch learning styles?